My Hubby is very particular about his chocolate chips cookies. He has this magical ability to recognize the perfection in them. As I refuse to buy a ready-made dough in a tube, I am looking far and low for the best recipe. Why do you think his favorite cookies are snickerdoodle and not the all-time-classic chocolate chip? Because I have not perfected them yet… And when it comes to classics – I want perfection. So I have been on the hunt for the best chocolate chip cookies recipe. I tried so many of them, I could write a book about it! Few times I actually got them right! I was happy and content. Until I made them again… and they would raise too much… and be too chunky…. What are the features I am looking for? Flat, crispy edges, gooey and chewy inside, studded with chocolate chips and “when you pull the cookie apart it has to have the gooey threads”. Yes, I did Google it out. And got 2,3 million results! It means that I am not the only one who wants my chocolate chip cookies that way. But I am not being discouraged by the statistics! I accept the challenge with grace! I will make batches and batches until my apron hangs on a single thread and there is no more flour in town! Aaaanyways, at this point I am baking the cookie dough without the chips. I will bake a first dozen and then I know if it’s what I am looking for. This time, the cookie was chewy on the inside and had the crispy edges, but it was too chunky, and there was no gooey threads. So I added white chocolate chips and raisins to the dough and instantly, magical-y the cookie was accepted and yummy. In a medium mixing bowl, whisk together the dry ingredients ( flour, soda ). Set aside. In a large mixing bowl, beat the butter for 2 minutes. Add sugars and salt. Beat until fluffy. Add the egg and vanilla. Mix until incorporated. Add the flour mixture and stir it in. Add the chips and raisins and stir again. Scoop the dough with a cookie scoop or a tablespoon onto the baking sheet. Bake 11-12 minutes, until the edges start to brown. Please, don’t think it’s a reject cookie recipe. They are really delicious! If you are a fan of white chocolate and raisins combo – you will love these! I will keep you posted on my search and if you have any tips or suggestions, please feel free to leave them in the comments. I am eager to hear them! 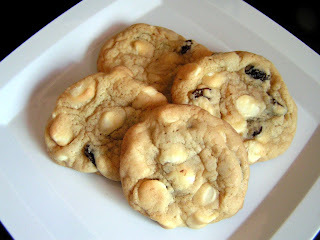 I have never thought of the white chocolate chips with the raisins, but it does sound like a tasty combo! Your explanation of these does make me want to try them, but your picture has some influence too. Great one for the cookie jar! It's a tasty combo indeed! Thank you, Tina! I had to giggle when I read your post – I google textures of cookies all the time…my boyfriend likes them kind of crispy – more wafery, so I can't tell you how many times I've searched some version of “crunchy chocolate chip cookie” or “crackled cookie” etc etc. Your recipe looks fantastic, and I like the combo of white chocolate and raisins! Lol How fun! At least we have a sweet challenge 🙂 Thank you, Julia! My husband loves both white chocolate and raisins. Those are a perfect afternoon snack for him. That's great! Thank you, Angie! Your cookies look perfect indeed! Love the white chocolate and raisins combo! I am so glad! Thank you, Tina! Oh yes, you've got all the good stuff in these cookies – delicious! OOooooh I love the combination of white chocolate and raisins. I just know you will love 'em! Thank you, Rachel! You definitely described my perfect cookie! Has to be crisp on the edges and gooey in the middle. My hubby like crisp all the way through, so our cookies get baked for different times! It's good to know I am not alone in this 🙂 Thank you, Karen! I have never tried white chocolate chip in my cookies. Would love to give a try to your recipe. Your clicks are looking great! White chocolate and raisin is a combo that is for me 🙂 I will try these for sure…even though they are not THE ones 😉 Thanks for sharing! Sounds great, Stephanie! Thank you! Me Cookie Monster! I am SO with you about wanting to make the perfect chocolate chip cookie. I dream about such things too! So tickled you shared this at Weekend Potluck – so happy to have you – please link up again soon. It's easy to see you have some awesome recipes to share!!!!!!!!!! I love Weekend Potluck! Thank you so much for stopping by! I cannot resist a cookie with white chocolate…yours look outstanding!!! Yay! Thank you so much, Lizzy! 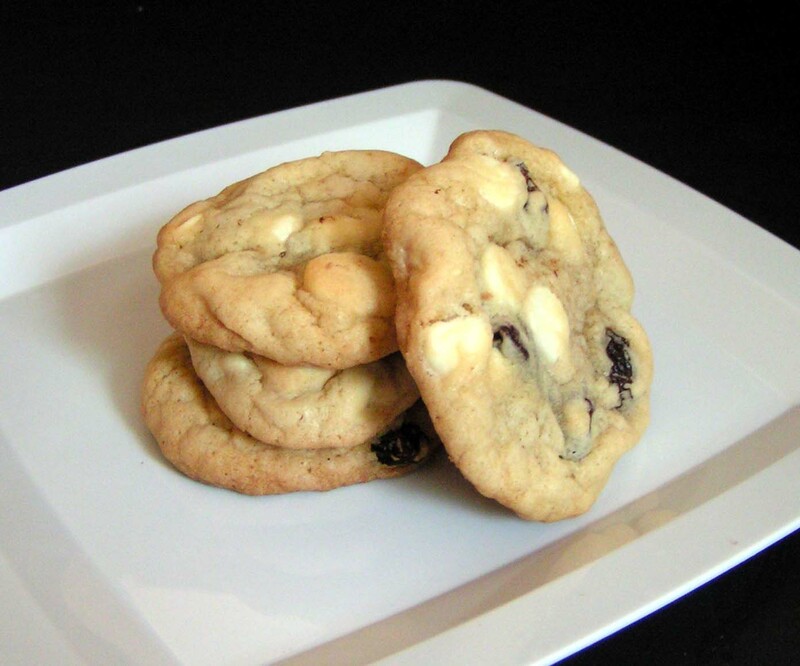 The best cookies are always with white chocolate chips! 🙂 Well said, Natalie! Thank you so much! I love making cookies with white chocolate chips! Yay! I hope you will make these! Thank you, Elizabeth! I have this type here too 🙂 Thankl yomu, Ramona! I have not because of the bread flour. Thank you for the suggestion though. I am desperate for the one recipe, so I might just have to give it a try. Thank you, Jenn!